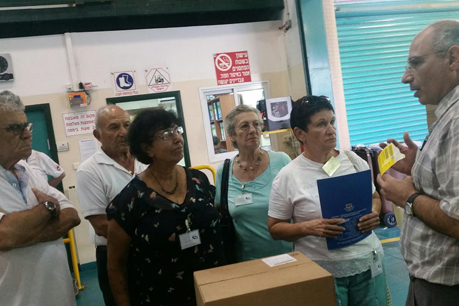 The judges of the Council for a Beautiful Israel have visited the Sarel Company within the framework of the Beautiful and Sustainable Industry competition, one of the first competitions organized by the Council. The competition is held annually since 1980 under the auspices of the Ministry of Economy in collaboration with the Manufacturers Association of Israel and the Kibbutz Industries Association. It is aimed at encouraging the environmental development and visual improvement in the industrial sector for the wellbeing of people and communities and as part of a comprehensive approach to the quality of life. For the last 15 years, Sarel Company participates in the competition for the services sector. In the course of this period, the company was awarded the 5 Stars of Beauty, was selected twice for the Banner of Beauty contest and won it in 2008. In 2009, the company received a certificate of honor in recognition of its being awarded the 5 Stars of Beauty for ten years in a row.